Angelica Fenner is cross-appointed Associate Professor of German and Cinema Studies at the University of Toronto and the current Graduate Coordinator in the Cinema Studies Institute. 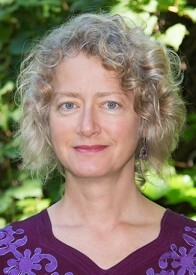 She is the author of Race Under Reconstruction in German Cinema (University of Toronto Press, 2011), co-editor of The Autobiographical Turn in Germanophone Documentary and Experimental Film (Camden House, 2014), and currently completing a book project on first-person film-making in contemporary Germany. Her interests encompass intersectional politics of gender, race, class in visual cultures; gender and authorship; migration and diaspora in European cinemas; documentary theory and history; and German film history. “The Redistribution of the Sensible in Thomas Arslan’s From Afar.” In European Visions: Small Cinemas in Transition, eds. Janelle Blankenship and Tobias Nagl, 367-388. Bielefeld: Transcript Verlag, 2015. “Rising in the East/Sett(l)ing in the West: Tibetan Buddhism in Contemporary Documentary.” In The Blackwell Companion to Contemporary Documentary Film, eds. Alex Juhasz and Alisa Lebow, 341-365. Boston: Wiley-Blackwell, 2015. The Autobiographical Turn in German Documentary and Experimental Film. Co-edited with Robin Curtis. Rochester, NY: Camden House, 2014. 390 pp. “Clearing Out Family History in Seven Dumpsters and a Corpse.” Co-authored with Waltraud Maierhofer. In The Autobiographical Turn in Contemporary German Documentary and Experimental Film, edited by Robin Curtis and Angelica Fenner 210-31. Rochester, NY: Camden, 2014. “The Gen(t)rification of Heimat: Framing Hamburg’s Creative Class in Fatih Akin’s Soul Kitchen.” In The Place of Politics in German, edited by Martin Blumenthal-Barby, 243-268. Bielefeld: Aisthesis, 2014. “Roots and Routes of the Diasporic Documentarian: A Psychogeography of Fatih Akin’s Wir haben vergessen zürück zu kehren.” In Turkish-German Cinema in the New Millenium: Sites, Sounds, and Screens, eds. Sabine Hake and Barbara Mennell, 59-71. New York: Berghahn Press, 2012. “Jennifer Fox’s Transcultural Talking Cure: Flying: Confessions of a Free Woman.” In The Cinema of Me: The Self and Subjectivity in First Person Documentary Film, ed. Alisa Lebow.119-141. London: Wallflower Press, 2012. Race Under Reconstruction in German Cinema: Robert Stemmle’s Toxi. University of Toronto Press, 2011. 283 pp. “Cinematic Discourses of Race and Reconstruction in Transnational Perspective.” In From Black to Schwarz: Cultural Crossover between African America and Germany, eds. Maria Diedrich & Jürgen Heinrichs, 227-244. LIT Verlag, 2010. “Aural Topographies of Migration in Yamina Benguigui’s Inch’Allah dimanche.” Camera Obscura 66 (2007): 93-127. “Beyond the Pleasure Principle: Repetition Trauma and the Tyrannies of Genre in Frieder Schlaich’s Otomo.” In Fascism and Neo-Fascism: Critical Writings on the Radical Right in Europe, eds. Angelica Fenner & Eric Weitz, 259-278. NY: Palgrave, 2004. Fascism and Neo-Fascism: Critical Writings on the Radical Right in Europe. Co-edited with Eric Weitz. NY: Palgrave, 2004. 286 pp. “Traversing the Representational Politics of Migration in Xavier Koller’s Journey of Hope.” In Moving Pictures, Traveling Identities: Exile, Migration, Border Crossing in Cinema, ed. Eva Rueschmann, 18-38. Oxford: University of Mississippi Press, 2003.